This is a made to order item. Please allow up to 6 weeks production prior to shipment. Once shipped, please allow up to 3 additional weeks transit time for your item to arrive. Rustic and modern, our Gwyneth Collection delivers clean lines with subtle strokes of sophistication. Quartered white oak is finished with a cerusing technique, which allows white highlights in the grain to shine through the dark taupe finish. Mondrian styled blocks and geometric patterns along with a silver leaf and complimentary faux shagreen satisfies the modern movement, while offering unforgettable style. Stately and chic with a unique, modern flair, this handsome armchair makes an inviting addition to any room from dining room to den. 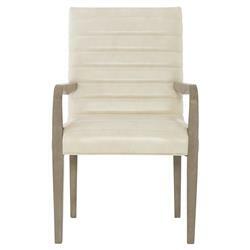 The supply cushioned seat, upholstered in a creamy ivory leather, is supported by dark taupe arms and legs for a striking contrast in color and texture.